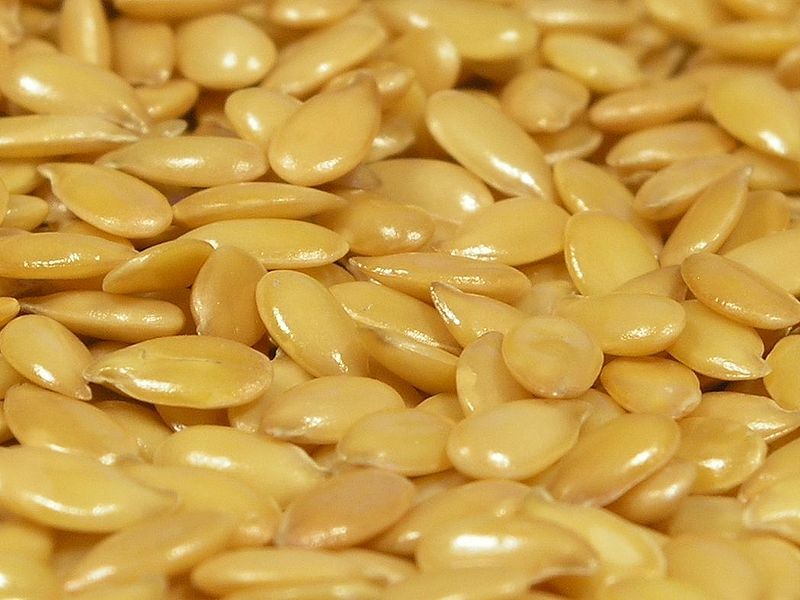 Flaxseed, a wonderfood that helps lower blood pressure, cholesterol and other ailments. Flaxseed is also called 'linseed'. For the cricketers amongst you out there, you probably used it to oil your cricket bat (as I did many moons ago in the form of linseed oil), never thinking of ingesting it in any shape or form! It is loaded with vitamins, minerals, soluble and insoluble fiber (good for reducing cholesterol) and also has two other very important substances, phytochemicals called lignans and omega-3 fatty acids. Being very low in carbohydrates it is ideal for people who want, or need, to limit their intake of sugars and starches. One tablespoon of ground flax seed provides 1.6 grams of omega-3 fatty acids, which is at the top end of recommended daily intake. There are two varieties, that provide a colour range from amber through to a reddy-brown. For the stats people, 100 hundred grams of ground flaxseed supplies about 450 kilo-calories, 41 grams of fat, 28 grams of fiber, and 20 grams of protein. It happens to contain one of the richest sources of alpha-linoleic acid (ALA). This is considered a "good (super-unsaturated)" fat, one type of fatty acid in the omega-3 family, and very good for your heart. Getting all of your good fat from nuts or fish can be quite difficult as nuts also contain extra calories from carbs and protein. It’s certainly not very convenient preparing a fish meal everyday. Flax seed oil is quick and simple to use and contains mainly fat and far less calories than nuts. It is completely safe to take on a daily basis and has no negative side effects, but loads of plus points on the health side that are well researched and documented. People that work out regularly take it because our diet has to consist of protein, carbohydrates and fat. Both the ground flaxseed and oil are great sources of healthy fat required in our diets. Taking flax seed is just plain and simply 'good for you'. Everyone should take it in whatever form they prefer, 'whole', 'ground' or 'oil'. My preference is the organic ground flaxseed. It is so easy to add a teaspoonful to sandwiches or sprinkle a tablespoonful on a tomato-based sauce for the evening meal, but there are many ways to use. Add to yoghurt or salads, when making bread or cakes or to your morning cereal, whatever you fancy. For those that prefer taking an 'oil' capsule, this is fine, but they lack the fibre and lignan so are not deemed quite so healthy. 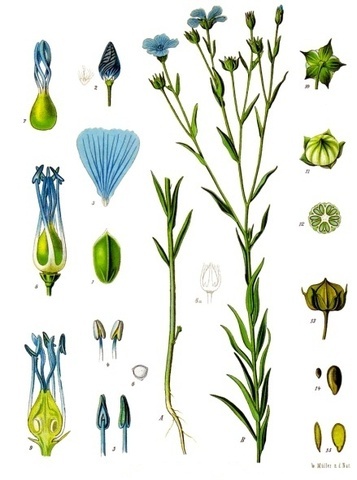 Historically, the flax plant has been around for centuries. Ancient Roman soldiers ate flaxseed along with onions and garlic, in order to have good health. 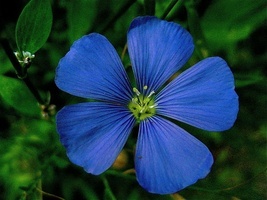 Flax is a plant that grows to 1.2 m tall and has slender stems. The leaves are green, 20–40 mm long and 3 mm broad. The dry capsule 5–9 mm diameter. 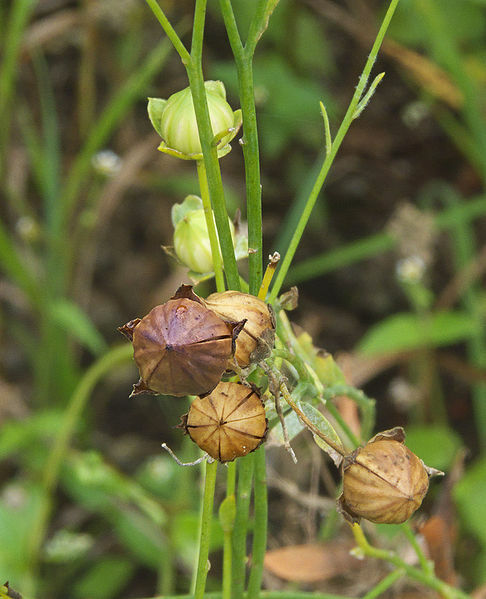 Inside there will are several glossy gold/brown seeds shaped like an apple pip, 4–7 mm long. The flowers are mostly pure pale blue (although they can also be bright red. They are 15–25 mm in diameter and have five petals.